R-1 Visa • Kidambi & Associates, P.C. An R-1 is a foreign national who could be temporarily employed at least part time (average of at least 20 hours per week) by a non-profit religious organization in the United States (or an organization which is affiliated with the religious denomination in the United States) to work as a minister or in a religious vocation or occupation. The applicant has been a member of the denomination for two years immediately preceding applying for religious worker status. The applicant is planning to work as a minister of that denomination, or in a religious occupation or vocation for a bona fide, non-profit religious organization (or a tax-exempt affiliate of such an organization). There is no requirement that individuals applying for “R” visas have a residence abroad that they have no intention of abandoning. However, they must intend to depart the U.S. at the end of their lawful status, absent specific indications or evidence to the contrary. The applicant has resided and been physically present outside the U.S. for the immediate prior year, if he or she has previously spent five years in this category. Every petition for an R-1 worker must be filed by a prospective or existing U.S. employer through the filing of a Form I-129, Petition for Nonimmigrant Worker. An R-1 visa cannot be issued at a U.S. Embassy or Consulate abroad without prior approval of Form I-129 by U.S. Citizenship and Immigration Services (USCIS). If the foreign national is visa-exempt (e.g. Canadian), he or she must present the original Form I-797, Notice of Action, reflecting an approval of a valid I-129 R petition at a port of entry. Important Note: Visa applicants must bring the approved I-129 petition receipt number to the interview, so that petition approval can be verified. There are certain general requirements which must be satisfied by the petitioning organization as well as by the religious worker, the beneficiary of the petition. These requirements are listed in the chart below. An R-1 status may be granted for an initial period of admission for up to 30 months. An extension of an R-1 status may be granted for up to an additional 30 months. The total stay in the United States in an R-1 status cannot exceed 60 months (5 years). R-1 worker’s spouse and unmarried children under the age of 21 may be eligible for R-2 classification. The dependents of an R-1 worker may not accept employment while in the United States in R-2 status. 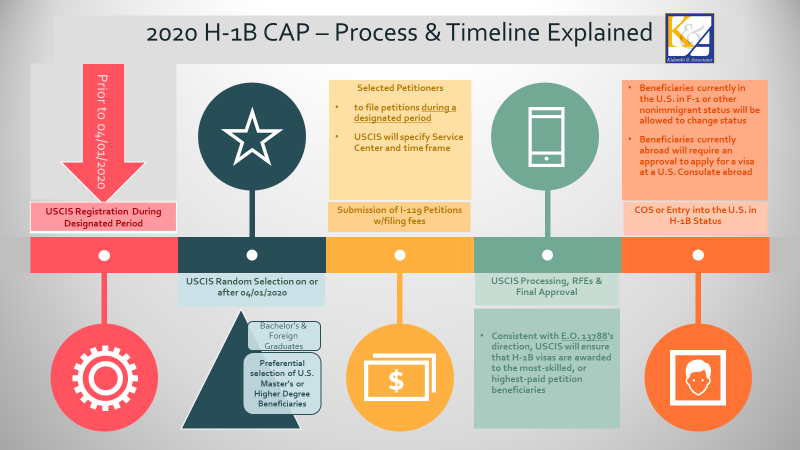 Premium processing for FY2020 cap-subject H-1B petitioners requesting a change of status on Form I-129 will begin on 5/20/19. For all other FY2020 H-1B cap-subject petitions, it will begin in June 2019 or later. From 5/20/19 until 6/3/19, final notices will not be sent using prepaid mailers. Read the USCIS news release. We have received credible reports from clients and other practitioners that the number of site visits targeting Consulting companies has increased significantly in the past several weeks. Employees should be made aware that site inspectors could call on them at the end client site unannounced. When this happens, employees must politely ask to see the site inspectors’ badge and id. They should also write down the officer’s name, email id and phone number for future contact. Site inspectors are not adjudicators and are instead charged with gathering information. Therefore, instead of panicking when this happens, employees should be counseled to treat it just as they would a traffic stop. Identify yourself and respond to any question(s) pertaining to your H-1B status. Employees should defer questions about the employer’s business, net income, number of employees, organizational hierarchy, etc., to the H.R. manager or H.R. contact within the employer organization. A failed site visit will result in either a Notice of Intent to Deny (in the case of pending petition), or a Notice of Intent to Revoke in the case of an approved petition. In both instances, Kidambi & Associates, P.C. will assist your organization respond and overcome this challenge. USCIS has received a sufficient number of petitions projected as needed to reach the congressionally-mandated 65,000 H-1B visa regular cap for fiscal year 2020. USCIS will next determine if they have received a sufficient number of petitions to meet the 20,000 H-1B visa U.S. advanced degree exemption, known as the master’s cap.